This entry was posted in Big Pharma, FDA, USDA, Healthcare, Obama and Company and tagged Conflict of Interest, FDA corruption, health, influence, lobbyists, negligence, Oversight, public safety. Bookmark the permalink. So, what else is new(s)?? Pingback: FDA System Approves Nonexistent Product from Nonexistent Company for Human Testing (via COTO Report) | Project L.I.T. Outsourcing has just become a way to rig the system- against those who paid for it. …my gut sank. That is *exactly* the structure behind the federal testing a and approval of voting machines. My point is, we don’t have a “pill problem” so much as a structural problem within the federal bureaucracy system. thanks for dropping by, Jim ~ you’re absolutely correct, this is exactly how voting systems are approved. Are there any sources for this story? This is no surprise…..just another example of behind the scenes decisions made to INCREASE the amount of sick and dying to further their population reduction agenda and make money while they are at it. Typical. If you go to the original (http://www.gaia-health.com/articles351/000378-system-sting.shtml), you’ll see references listed at the bottom. thanks so much for such a terrific article, Heidi ~ your humorous take on such blatant and dangerous corruption makes this piece primo. My thanks too Heidi! and it’s great that your article is getting so much attention now even tho the original sting stayed mostly under the radar in 2009. No wonder the university I work for doesn’t allow us to use an outside IRB. Now I’m on board with that, too. When confronted with a drug I look at its approval in other countries. Does the EU allow for this drug? Does Canada? All of these are much more strict than America in the drug approval process. Also, the EU is very quick about recalls and pulling approval. I’m in Scotland right now. 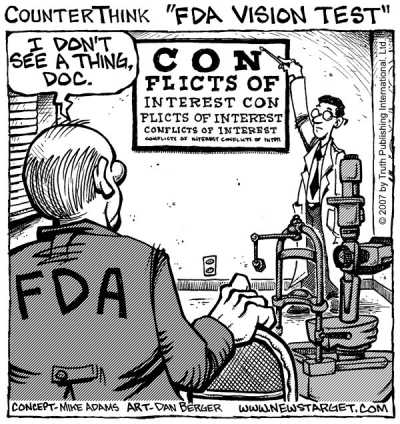 I hate to tell you, but the reality now is that the EU, Canada – virtually everywhere – follows the lead of the FDA. Sometimes they’re even worse here. Big Pharma is as dug in here as in the US. Sometimes, even worse. Denmark’s agency for controlling drugs actually sells them, and not only to people there, but also in other countries. Germany is already fully under Codex Alimentarius rules regarding vitamins, supplements, and herbs. The mess is everywhere. It’s never been about health. It’s all about making the world safe for multinational trade. Thanks for the article and for showing how again the American people are getting screwed by bureaucratic clowns who are more concerned about their pay scale and pensions than about doing their job. They should be serving time alongside the banksters that have robbed this country with the help of the govt. Am glad to visit this site.